Under heavy security by dozens of police officers and IDF soldiers, some 300 Peace Now activists held a demonstration in Hebron on Tuesday marking 40 years since the Six Day War and "the Israeli occupation" of the territories. The demonstration, held near the Tomb of the Patriarchs, passed largely without incidents and only several dozen right-wing activists arrived to hold a counter-protest. After the rally a bus filled with left-wing activists leaving Hebron came under assault as Palestinians hurled rocks at the vehicle and a police squad car traveling near it. No injuries were reported. The High Court authorized the demonstration on Monday after the army and police failed to green-light it, citing concerns of public disturbance should settlers clash with the protestors. The Jewish community in Hebron initially planned a large-scale counter-protest and said they would bring tomatoes and eggs to throw at the left-wing activists but it was ultimately decided not to disrupt the order so as to "not give Peace Now the attention they are looking for." Meretz MK Chaim Oron participated in the demonstration. "We should have come here next week, since it was on the seventh day of the Six Day War that this war that has lasted for 40 years began. On that day a group of settlers came here and forced the settlement of Hebron onto the State of Israel. We call on the Israeli government to enter negotiations with the Palestinian Authority. They say they want to talk, we must talk with them and we will also have to evacuate the settlers from Hebron." Peace Now secretary-general, Yariv Oppenheimer, said he was very pleased with the High Court's ruling to allow his movement to hold a demonstration in Hebron for the first time in five years. "The army wanted to succumb to the settlers' threats and prevent us from holding this protest, we are very pleased that the High Court did not cave to these threats," said Oppenheimer, adding that it would not be the movement's last protest in Hebron. Right-wing activists Itamar Ben-Gvir and Baruch Marzel explained why the counter-protest had been canceled later on Tuesday: "Peace Now came here to provoke us and we will not give them that satisfaction. "Once we realized that Peace Now was unable to bring the multitudes of people they had once brought, we canceled the buses meant to bring our people here to rally. We came here independently, to show that there are two sides to show there is another side to the story. They are traitors and this is not something serious, if we truly did not want them to come, they would not have come." 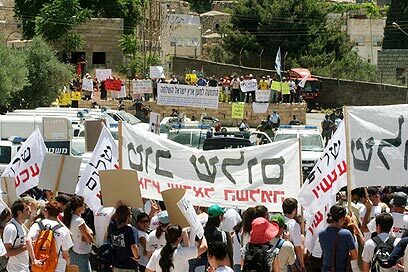 See all talkbacks "Peace Now in Hebron: Expel settlers from city"